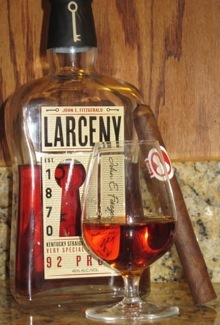 Larceny is the new bourbon from Heaven Hill Distillery in Bardstown, Kentucky. “Old Fitzgerald” has been (and still is) an old name in bourbon going back to the 1880s. According to the story, John E. Fitzgerald was a bourbon maker who opened up shop in the 1870s. But that turns out to be fiction; the real story is much more interesting. John E. Fitzgerald was a U.S. treasury agent who developed a taste for bourbon that he satisfied by stealing from the bonded warehouse he was given keys to in order to ensure taxes were properly collected. According to the story, he had a knack for finding the best barrels in the warehouse to thieve from, which eventually become known as “Fitzgerald barrels” (since no one was particularly interested in attempting to report a bonded treasury agent to the authorities). Owned and made by Julian “Pappy” Van Winkle—a name bourbon fans no doubt recognize—the bourbon was one of the first successful wheated bourbons (using wheat instead of rye as the second grain along with corn). Introduced earlier this year, Larceny follows a similar wheat-heavy recipe and is made at Heaven Hill distillery, which makes some other impressive, if under-rated, bourbons like the Evan Williams Single Barrel, Parker’s Heritage, and Elijah Craig 18 Year. The nose of the copper-colored bourbon features a sweet nose with lots of butterscotch and toffee, and hints of oak and cherry. The first sip reveals quite a bit of heat but, by the second and third, I’m enjoying a sweet, smooth combination of toffee, melon, dry cinnamon, and apples. The finish has honey and bread, and fades away at a medium speed that prompts you for a quick follow-up. While rye is known for adding spicy qualities to bourbon, wheat tends to result in a smoother blend, and that’s certainly true of Larceny. But it’s far more interesting and lively than another similarly-priced wheated bourbon, Maker’s Mark, which as I’ve gotten more and more into bourbon I’ve found trades a little too much character for it’s easy-drinking qualities. As far as cigar pairings go, Larceny is versatile, though I’d stay away from Connecticut wrappers if there is even a hint of bitterness, and also overly spicy or very full-bodied smokes. The Tatuaje Havana line, Illusione Epernay, CAO Concert, and My Father line all seem to fit the bill nicely. For the money (especially if you have the patience to send in for the rebate) it’s hard to not be impressed with Larceny. It’s perfect for a Maker’s Mark sipper starting to explore all that bourbon offers, but can be enjoyed by the most seasoned enthusiast. It actually is not all that dissimilar, except for price, from the highly sought-after Van Winkle Family Reserve. You might even call it a steal. Coincidentally, I picked up a bottle of this the other day at my local liquor store in Chicago. I’d have to agree with my colleague’s assessment. Given the price, I’ll probably start picking up a bottle of this from time to time as needed.